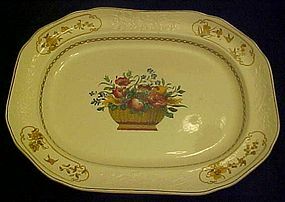 This would be a great accessory piece for your set of Alfred Meakin dinnerware. 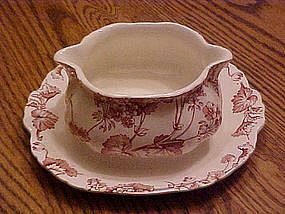 Harmony shape, pink Florette pattern transfer ware. 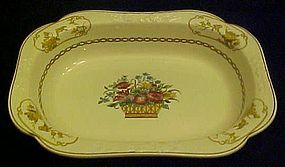 This piece is the gravy boat with attatched underplate. Perfect condition with no chips, dings, or cracks. Measures about 3 1/4" tall, and attached underplate is about 7 1/4" in diameter. 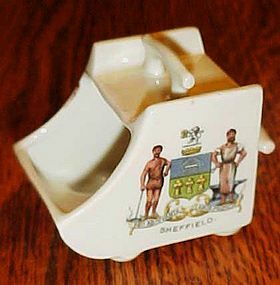 Antique Sheffield coat of arms, toothpick, salt dip??? 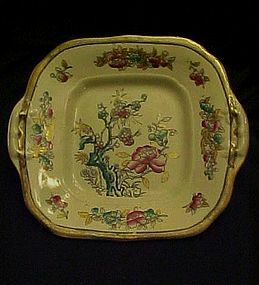 Antique glazed china item has the Sheffield coat of arms on one side, and has 4 tiny ball feet, and two handles. One on the back and the other on the top, 4085 stamped into the bottom under glaze. This could be a toothpick holder, a salt cellar, possibly used for cigarettes or even matches. It measures just over 2" tall. 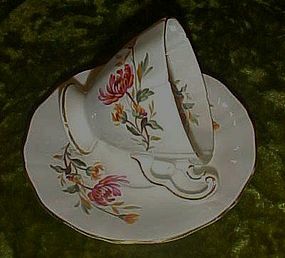 Perfect with no damages, and the coat of arms is in wonderful condition. Coat of arms, Deo Adjuvante, Labor Proficit, Sheffield. 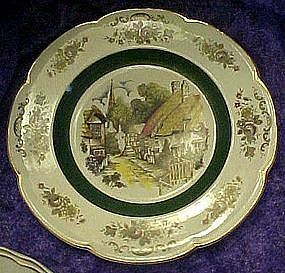 Large sevice plate or charger measures 10 5/8" and depicts one of the English village scenes they made. 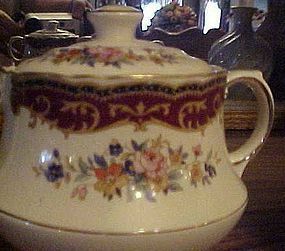 Dark green band and hand painted multi color decoration, with floral border and gold accent trim. 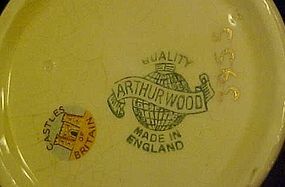 Made by Wood & Sons England. Perfect condition. 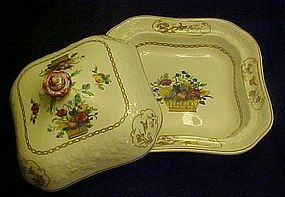 This is strikingly similar to the plates made for Princess house but ARE slightly different. This is a grand little butter pat. Stamped Jonroth England,Made by Adams England and imported for Rawding Distributing Company Winchester, Massachusetts. 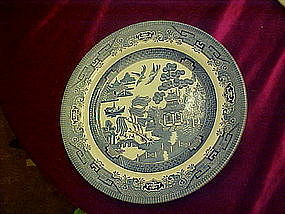 Pristine condition and measures 3 1/4" in diameter. 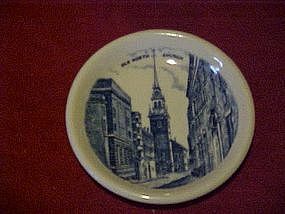 I believe this was a souvenir item featuring the Old North Church. Rich blue pattern on white. I am not sure of the age, it could be a lot older than I'm thinking. 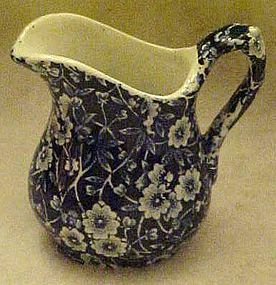 Pretty vintage pitcher in the blue calico chintz pattern. Cobalt blue background with all over white flowers. 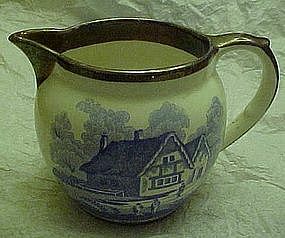 Made in England, Measures 3 3/4" tall to the top of the handle. Perfect condition. Gentle crazing on the bottom. 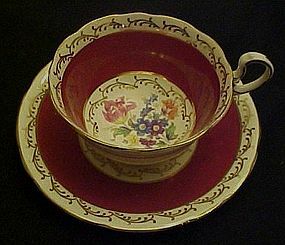 Made of heavy glazed china. No discoloration.